I’m having the same problem with my Sansa e130. I transfer purchased tracks on Rhapsody onto my SD card. My player will only read the previously imported tracks. This makes my player or my Rhapsody subscription worthless. Did you ever get a solution from Sandisk. I’m interested as to what you find out. 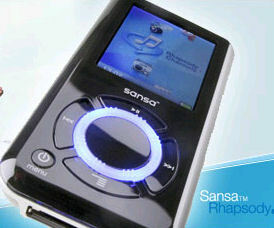 I had a conversation with Sansa today; they claim that they’re “working on making Rhapsody protected content compatible with MicroSD” but gave no time frame. Don’t hold your breath, I guess. 1) In Rhapsody 4.0, add the content to My Library. 5) Drag the content that you’ve downloaded to the mounted microSD drive. I haven’t figured out how to get Rhapsody 4.0 to reveal anything that’s on the microSD card. Why doesn’t Sandisk just come out and say .. “with the microSD card, you’re on your own”?